A new methodology is presented to create two-dimensional (2D) and three-dimensional (3D) tomographic reconstructions of mesospheric airglow layer structure using two-station all-sky image measurements. A fanning technique is presented that produces a series of cross-sectional 2D reconstructions, which are combined to create a 3D mapping of the airglow volume. The imaging configuration is discussed and the inherent challenges of using limited-angle data in tomographic reconstructions have been analyzed using artificially generated imaging objects. An iterative reconstruction method, the partially constrained algebraic reconstruction technique (PCART), was used in conjunction with a priori information of the airglow emission profile to constrain the height of the imaged region, thereby reducing the indeterminacy of the inverse problem. Synthetic projection data were acquired from the imaging objects and the forward problem to validate the tomographic method and to demonstrate the ability of this technique to accurately reconstruct information using only two ground-based sites. Reconstructions of the OH airglow layer were created using data recorded by all-sky CCD cameras located at Bear Lake Observatory, Utah, and at Star Valley, Wyoming, with an optimal site separation of ~100 km. The ability to extend powerful 2D and 3D tomographic methods to two-station ground-based measurements offers obvious practical advantages for new measurement programs. The importance and applications of mesospheric tomographic reconstructions in airglow studies, as well as the need for future measurements and continued development of techniques of this type, are discussed. © 2012 Optical Society of America. Published in Applied Optics. Publisher PDF available for download through link above. Hart, V. P., Doyle, T. E., Taylor, M. J., Carruth, B. L., Pautet, P. -., & Zhao, Y. (2012). 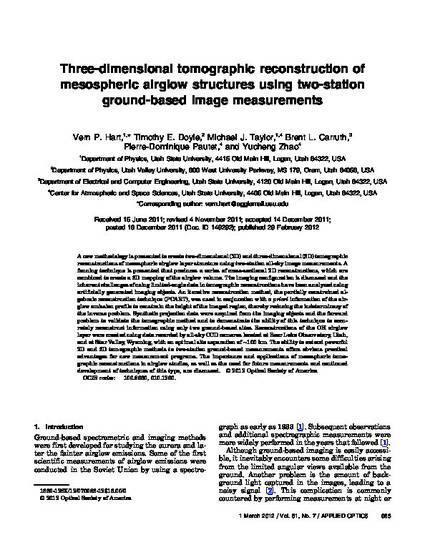 Three-dimensional tomographic reconstruction of mesospheric airglow structures using two-station ground-based image measurements. Applied Optics, 51(7), 963-974.